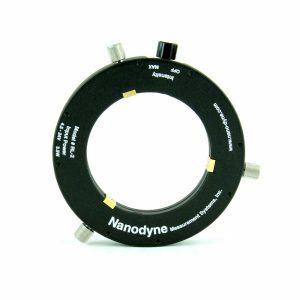 The Nanodyne Stereo Zoom Microscope LED Ring Light is designed to fit a wide range of stereo zoom microscopes. Its small diameter at 3.5 inches and height of only 1/2 inch provide maximum access to parts being soldered or manipulated with tweezers. With a brightness of 14,000 foot candles (150,000 Lux) it is as bright as fiber optic ring lights using 150W halogen bulbs, yet it uses only 3.5W at maximum intensity and has 0-100% intensity adjustment built in, with no extra control box using valuable bench space required. The three stainless steel clamping screws only rotate, they do not move in or out. Only the brass jaws move, and since they do not rotate, they do not chew up the surface of your microscope when clamping the ring light to it. The housing is injection molded 35% glass filled PPA with a tensile strength of 31,900 psi which is as strong as many aluminum alloys. Click on the image or text below for more details.